The establishment in the year 1992, we ‘Khanna Poly Rib Pvt. Ltd’ are manufacturer, supplier & exporter of Sleeper Pads, Plastic Sprockets And Star Wheel, Polyethylene Rods, Plastic Sprockets, Co-extruded Double Color Sheets, Plascon Products, Wheels Disc, Polyethylene Sheets & Rods, Polyethylene Sheet, UHMW Profiles & Tapes, Polypropylene Rod & Sheet, Abs Embossed Sheets, Plascon Products, Forming Boards, Sleeper Pads, Low Density Polyethylene, Grid & Wheels Disc, Sleeper Pads, Plastic Cones, Plastic Cones, Plastic Sprockets, Trolley Wheels, Star Wheel, Plastic Cones, Trolley Wheels, Forming Boards, Sleeper Pads, LDPE Sheets in Kanpur, India. The wide gamut of products offered by us is widely useful in the production of Engineering Plastic Products in manufacturing blocks and sheets. Our company is considered as a specialist in offering the most sought after range of polypropylene sheets & rods, polyethylene sheets & rods, low density polyethylene, HDPE/hm HDPE (high density & high molecular high density polyethylene), abs sheets, hips sheets, polyamide products, plasmon products for pulp & paper industry, plastic components, sleeper pads, sprockets & star wheel, grid & wheel disc etc. Also, we offer Infeed Worm and Screw, UHMW Components, UHMW Profiles & Tapes, Conveyor Guides, Conveyor Components, Guides, Pinion & Sprockets, Trolley Wheels and Extruded Profiles. 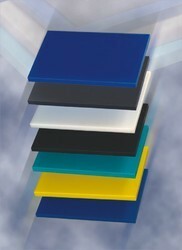 Taking advantage of our latest infrastructure facility, we are able to offer the best quality range of Plastic Products. Being a client centric organization, we ensure to take into consideration the diverse requirements of our clients and offer suitable range of products. Thus, these products are highly demanded among our international client base. With the active support of our team of experts, we are able to fabricate a wide range of flawless Plastic Products. These products adhere to international quality standards set by the industry. We are able to gain a strong foothold in the industry under the effective management and leadership of Mr. Mohit Khanna (Director). With his enriched business experience and high acumen, we are able to realize the goals and objectives of our company. Our company is blessed with a huge and well-structured infrastructure facility. We have installed some of the latest and advanced machinery and equipment in our manufacturing unit. These are regularly maintained and updated as and when required. We are supported by our highly efficient and experienced engineers and technical staff. They are experts in their respective domain and well-trained to perform to the best of their capabilities. We have developed a fully furnished warehousing and packaging facility. Polyrib an ultra high molecular weight polymer is an engineering plastic developed in west European Countries 3 to 4 decades ago. Most popular among mines, port, ship building, transportation of bulk materials, manufacturers of fertilizers, Chemical, Petro Chemicals, Pharmaceuticals, Textiles & Power station. Numerous items are developed for diverse industrial application specially for Paper-Board-Pulp, Asbestos, Cement, Metal refining, coal, Chalk, we with the most modern sintered compression method process Blocks thick as well as thin, components can be fabricated as per drawing Intricate parts, assembled parts, metal insert Polyrib spares are also made. Off cut sizes are our speciality. We achieved a lot with long practical research & technical guidance of our consumers in different parts of our country.